Christopher Jaroniec received his B.S. degree in Chemistry from Kent State University in 1997, and his Ph.D. in Physical Chemistry from the Massachusetts Institute of Technology in 2003, where he was a National Science Foundation Graduate Research Fellow with Robert Griffin and worked on the development of magic-angle spinning solid-state NMR methodology with applications to structural analysis of peptides and proteins. He was a Damon Runyon Cancer Research Foundation Postdoctoral Fellow with Ad Bax at the National Institutes of Health, where he worked on the characterization of the three-dimensional structure and conformational dynamics of the micelle-bound fusion domain of HIV-1 gp41 protein using solution-state NMR spectroscopy and the development of solution-state NMR methods for the determination of residual dipolar couplings in proteins and nucleic acids. Dr. Jaroniec joined The Ohio State University as an Assistant Professor in 2006, and was promoted to Associate Professor in 2011 and Professor in 2014. 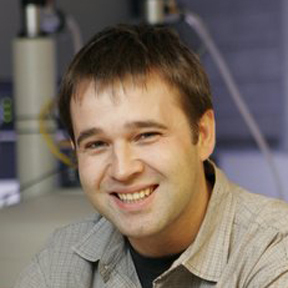 His research interests are in the development and applications of advanced NMR methods for the determination of structure, dynamics and interactions of supramolecular protein and protein-DNA assemblies, including prion amyloids and chromatin.